Engaging sensory play uses all 5 senses and promotes integration; the ability of their brains to process all the information they receive via touch, smell, hearing, vision and occasionally taste. As children pour, dump, build, and scoop, they explore and learn about spatial concepts like full/empty, over/under, in/out. They learn pre-math concepts along with language and vocabulary for important cognitive development. Art is an essential component to learning that encourages exploration and discovery through creative play. Art develops hand-eye coordination, stimulates perception, and encourages children to pay attention to the physical space around them. Art is a natural activity giving children the freedom to manipulate different materials in an organic and unstructured way that allows for exploration and experimentation. Children can share and reflect on their works of art with loved ones, which is wonderful for their self esteem and for connecting with family and friends. 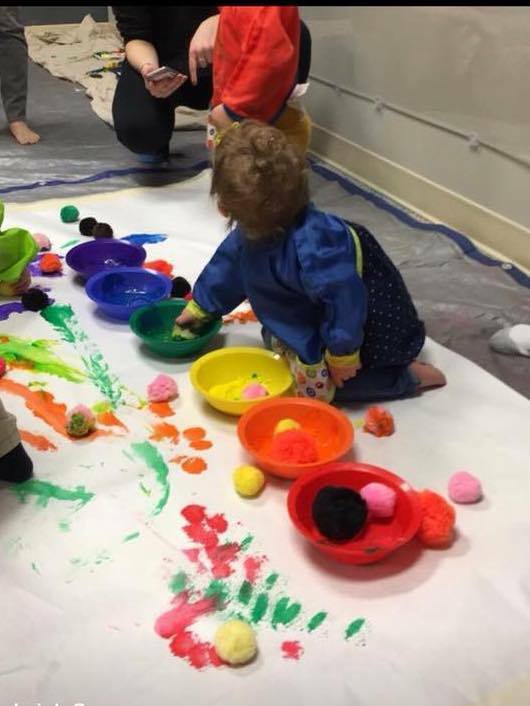 All of our sensory art classes are carefully designed with creative exploration in mind. Come join in the fun!